Who wouldn't want to learn how to play guitar and to be able to do it in an easy manner, such as learning it through youtube. The more technology progresses the cooler the apps become, along with new innovative ideas. We are true fans of adding new arrows to the quiver and a tool such as Soundslice, just might help the budding guitarist, go from good to great. "As of yesterday, there were only two ways to learn guitar music from the web: Googling a tablature file and emulating another guitarist on YouTube. While both are easier (and cheaper) than buying a book of sheet music, they are not without tedium. Tablature files (or “tabs” — a simplified guitar notation in plain text format) are aggregated by shady content farms with strong SEO and dubious quality control. YouTube videos provide audio and visual instruction, but require patience and the ability to “read the fingers” of the performer. 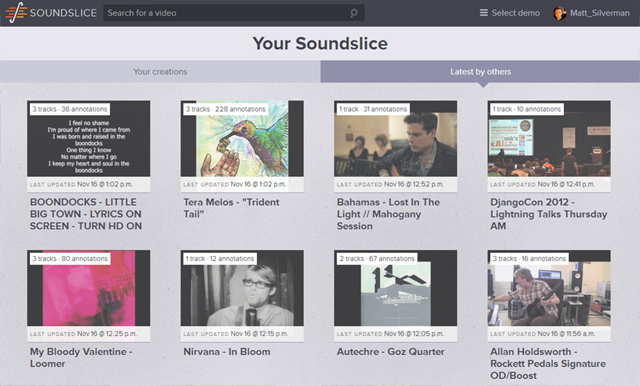 That’s why Soundslice is a revelation for self-taught musicians. 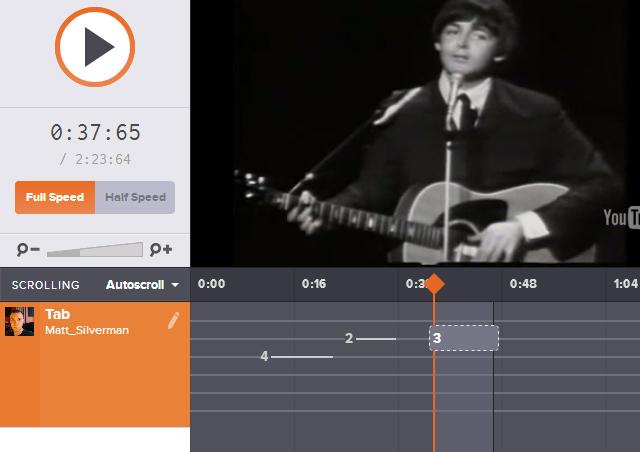 Built on YouTube’s API, it’s a transcription interface that syncs tablature and videos so players get the best of both worlds. You can also play the video at half speed (without changing the pitch) and loop small sections if you’re trying to pin down a tricky riff. Everything functions in your web browser or iPad — there’s no software or apps to install. While these tools are outstanding in their own right, the big promise here is in creating a rich trove of living, accurate guitar tutorials for everyone on the web to enjoy. Drag the length of the note on the string and add the fret number. Space bar will start and pause the video. 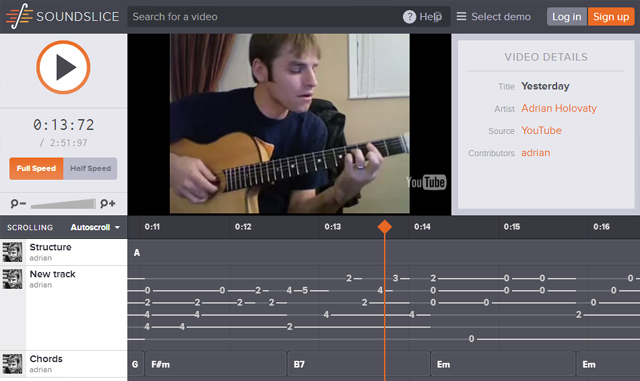 You quickly realize that Soundslice adds a temporal dimension to tablature without need of time signature or measures. If the community takes off, it could fundamentally change how the Internet thinks about, creates and shares this kind of notation. I asked Holovaty about the potential for Soundslice to become a social network. That work will also be connected to your Soundslice account. Savvy transcribers might sync their own videos to teach, thus generating views and ad revenue from YouTube’s partner program. There’s a lot of potential for power users. Current tab repositories are a cluttered mess. A song might have 20 versions, each with its own errors or embellishments. Quality control of user generated content can be a challenge, but Holovaty sees two potential modes. The other challenge for UGC networks is monetization. Regarding that automated transcription, Holovaty is experimenting with software created by The Echo Nest — algorithms that power music analysis apps like Spotify and iheartradio. Turns out, auto-generating sheet music from a complex recording is still a long way off. It’s a computational feat akin to sentient artificial intelligence, says Holovaty, who has been studying this kind of technology for some time. “The Echo Nest has some nice APIs that make automated guesses at the underlying musical information in an audio recording,” he says. This means that a human could provide the framework for the transcription, and an algorithm could work from that to fill in the gaps, speeding up the process. Holovaty hopes to include this in future paid accounts. For now, he and his designer PJ Macklin (the only two people working on Soundslice at the moment) are looking forward to seeing what users create, and adding features based on feedback. “Next up is the long list of feature additions and improvements. And of course, paying the bills and getting people to use it!”"
Thumbnail image courtesy of Dylan Adams, Flickr. Do You Lust For Vintage Motorcycles? Was The First Monster Truck Actually A Car? All Rights Reserved Worldwide. Copyright © 2014 Rusty Knuckles.